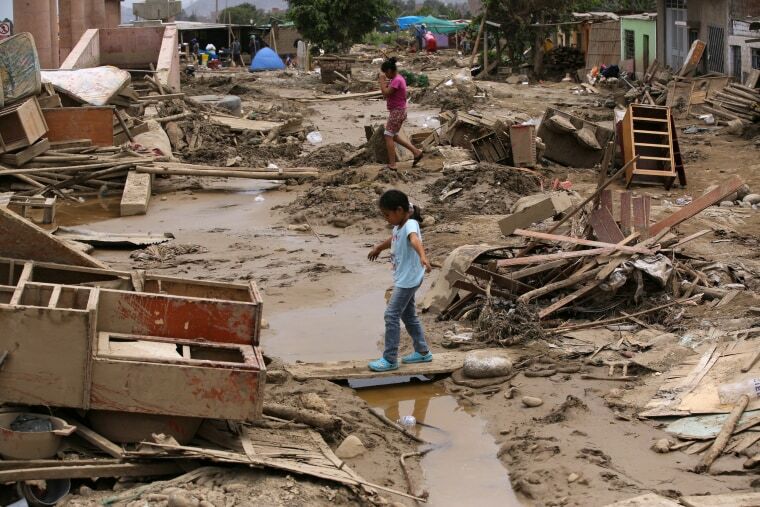 Mudslides have struck across the Andean nation where dozens have been killed and many of the hardest hit are those who can least afford it. 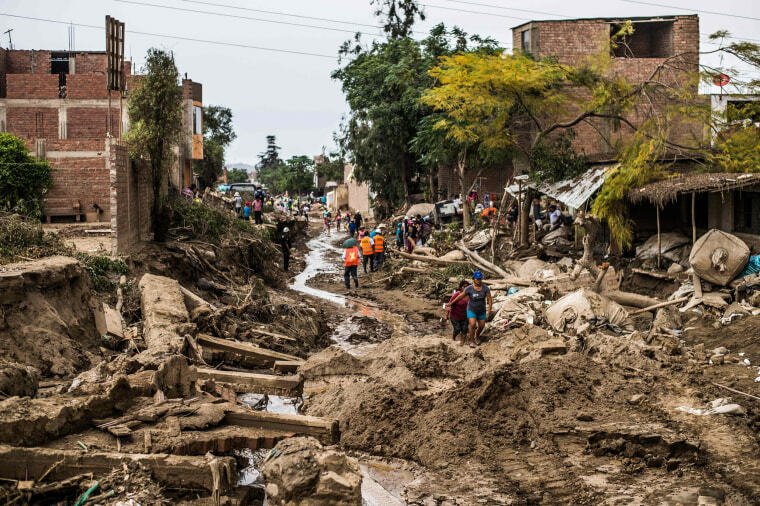 Residents wade through water as a flash flood brings mud and debris in Trujillo, Peru on March 18, 2017. 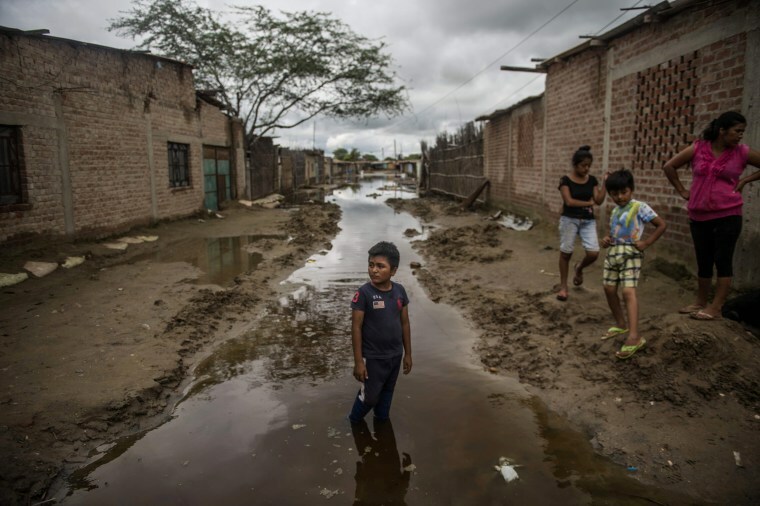 Across Peru, dozens have been killed and tens of thousands displaced after sudden warming of Pacific waters off the coast unleashed torrential downpours in recent weeks. It is part of a localized El Niño phenomenon that is forecast to stretch into April. 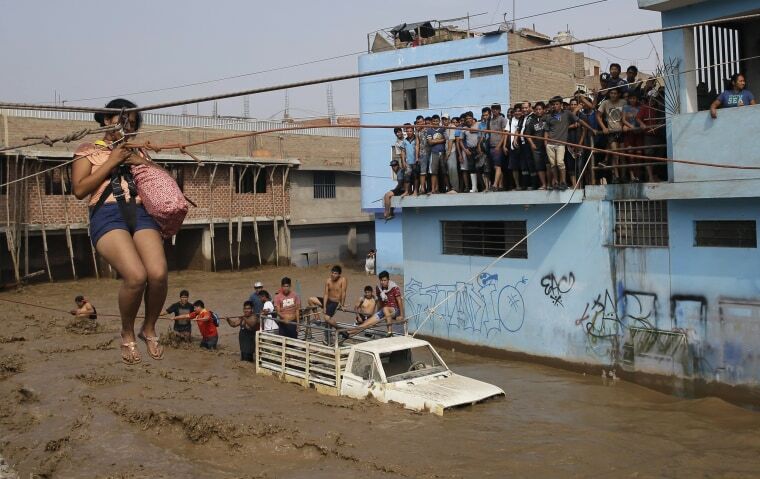 People walk through the damage caused by flash floods in Huachipa district, east of Lima on March 19. 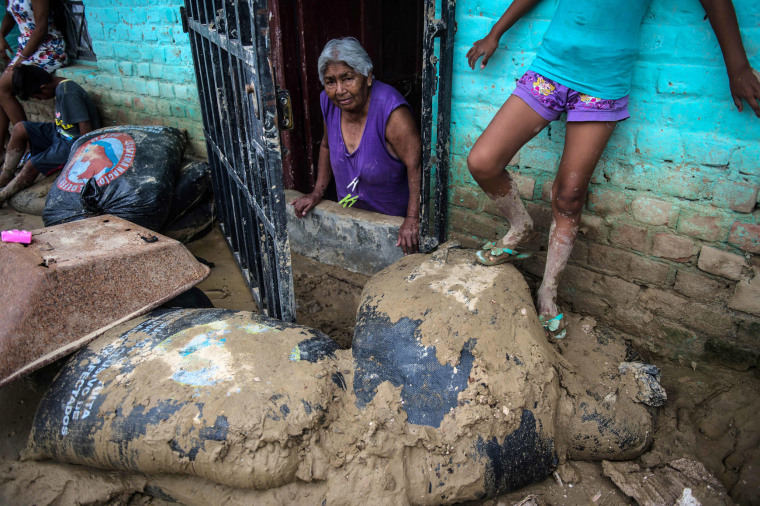 A resident stands on sandbags put in place to keep out floodwaters in the province of Paita in Piura on March 24. 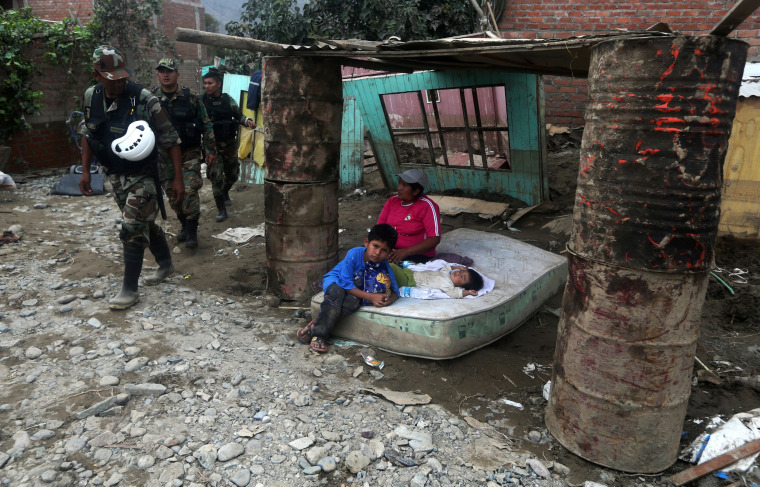 Survivors lie on a mattress near their home as rescue police walk past in Huachipa, Lima on March 18. 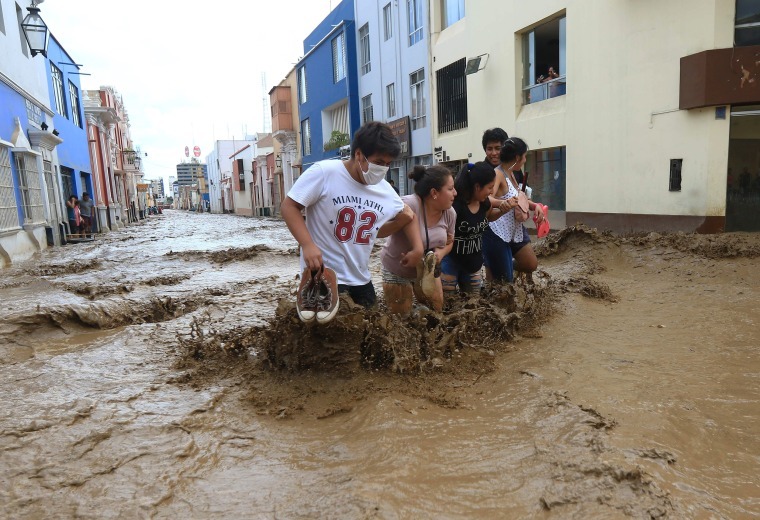 Residents walk on a flooded street after rivers breached their banks in Huachipa on March 20. 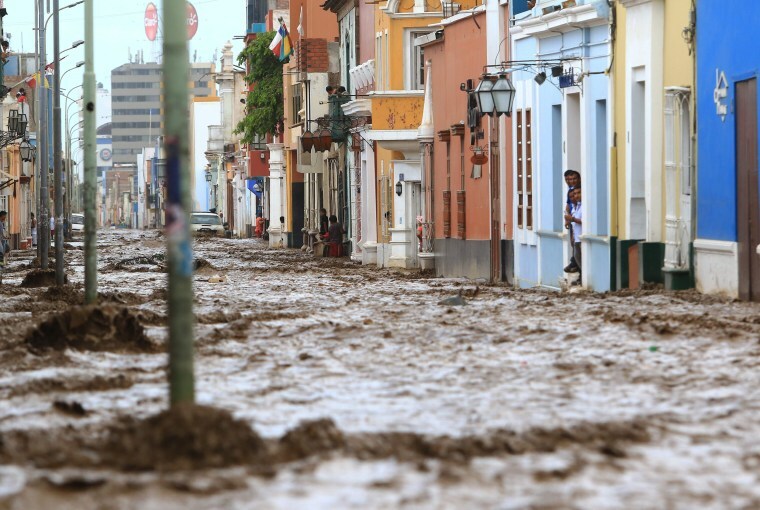 A flash flood hits the colorful historic center of Trujillo on March 18. 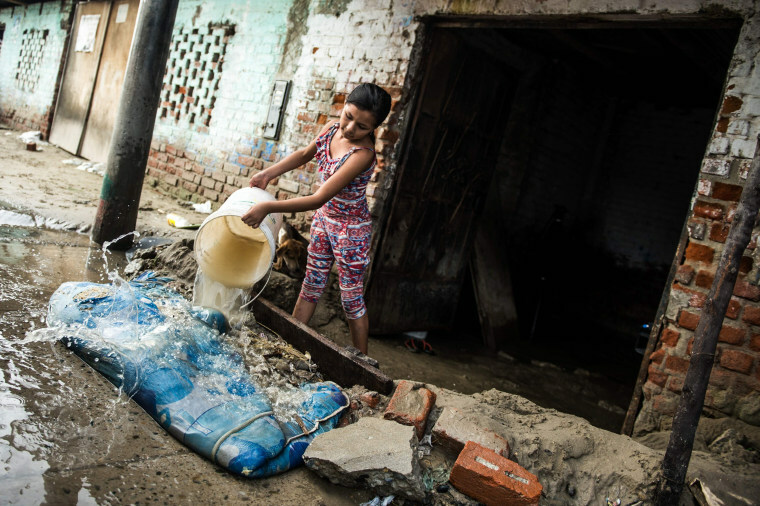 A girl removes water out of her flooded house in the El Indio settlement on the outskirts of Piura, in northern Peru on March 23. 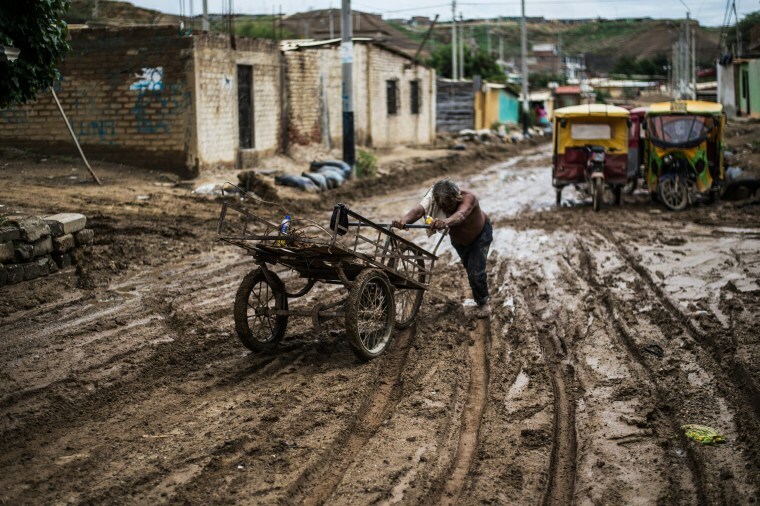 A resident pushes his cart through the mud in the province of Paita in Piura on March 24. 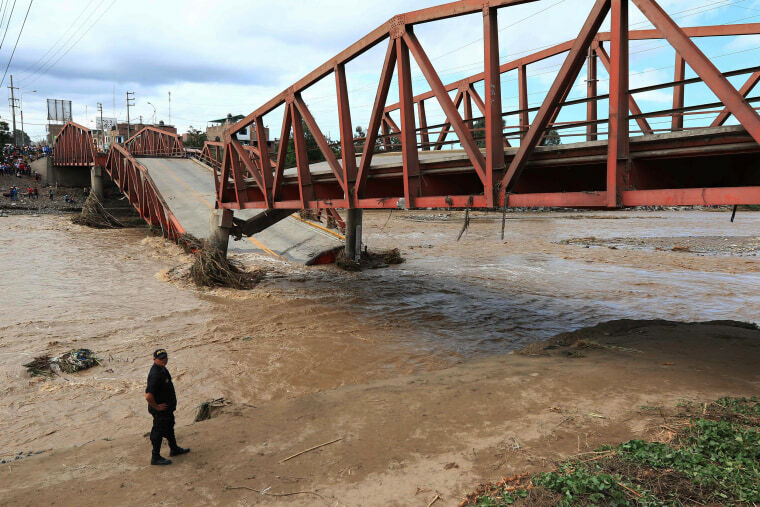 The Evitamiento highway collapsed from flash floods in Trujillo on March 20.Peru is expected to spend at least $3.75 million in repairing bridges and roads, according to the Central Bank, but the economic toll is still accumulating. Another two weeks of rain are forecast and the state meteorological agency expects the ocean warming causing the storms to continue through April. 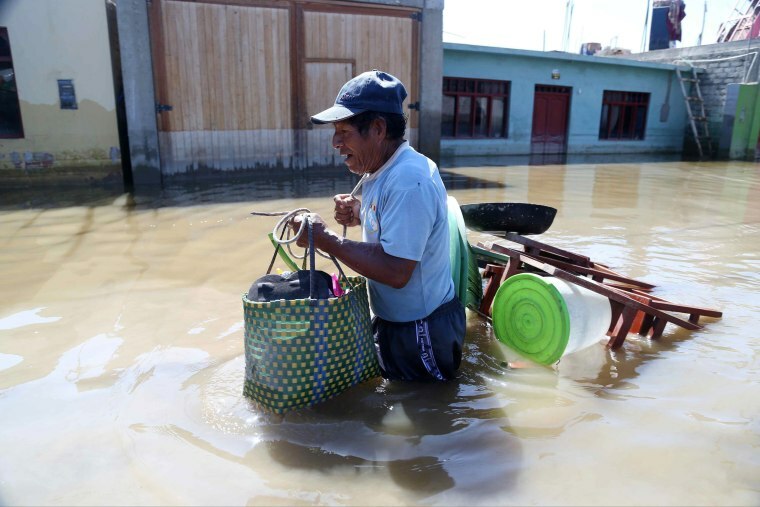 A man walks next to a flooded home in the Castilla district of Piura on March 16. 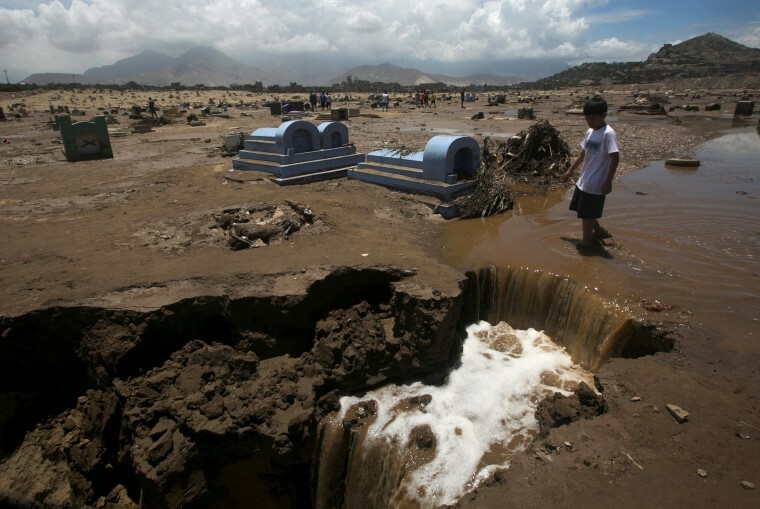 A boy stands in a damaged cemetery in Trujillo on March 16. 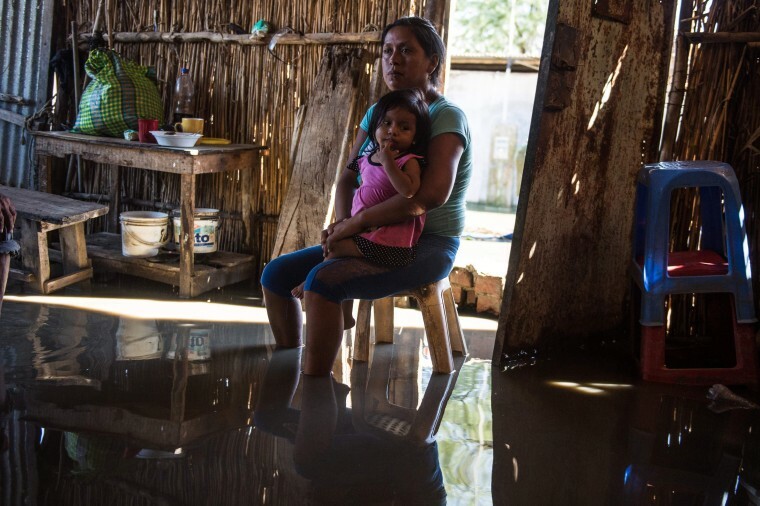 A woman and child sit in a flooded house at the El Indio settlement on the outskirts of Piura on March 23. 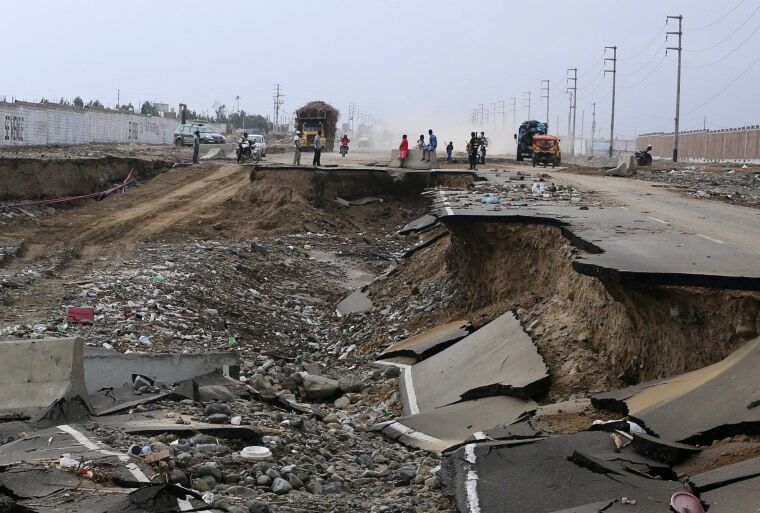 A collapsed road in Trujillo on March 22. 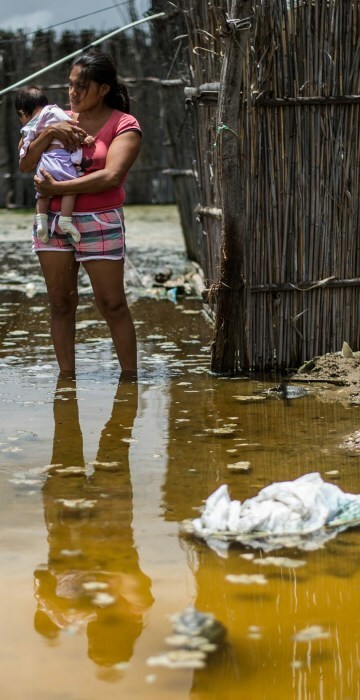 A woman and her baby stand in a flooded street in the province of La Union in Piura on March 25. 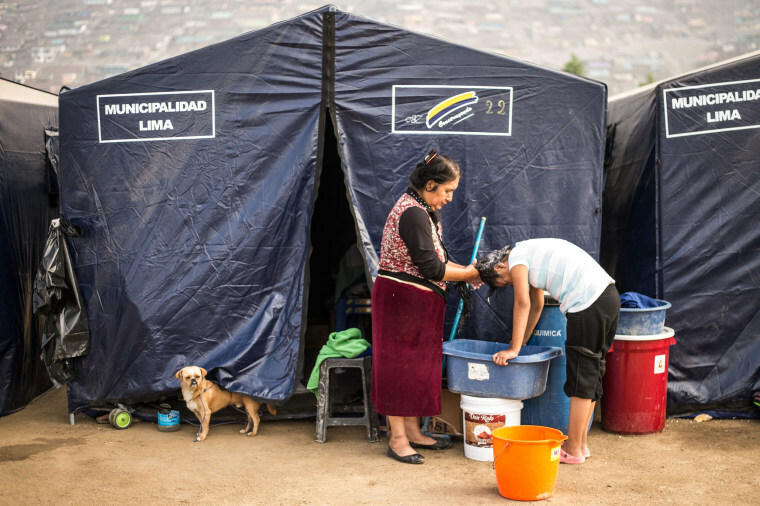 A woman gets her hair washed at a camp set up by volunteers and authorities in the district of Huachipa, east of Lima on March 21. 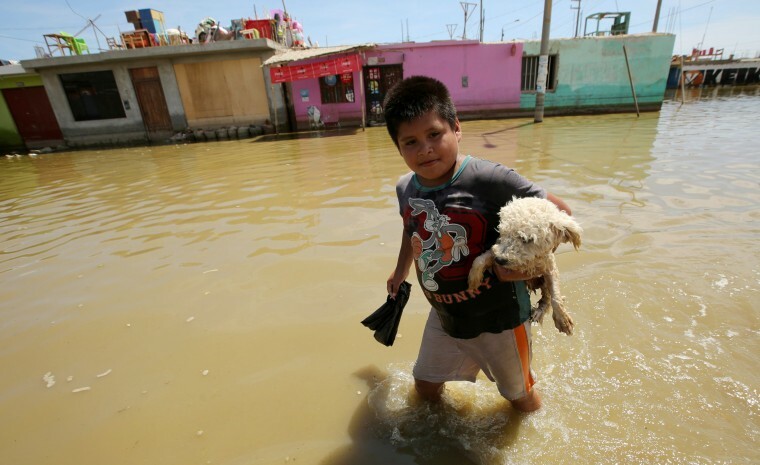 A boy holding a dog crosses a flooded street in Huarmey, Ancash on March 22. 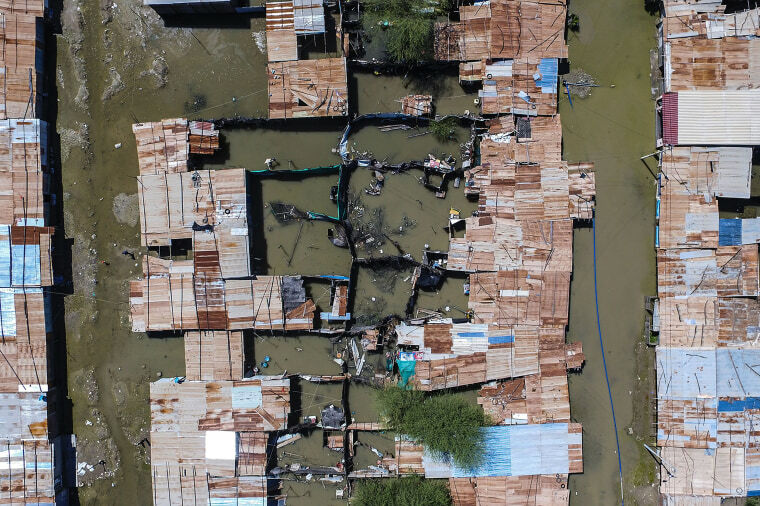 Red Cross officials have expressed concern about the potential for outbreaks of mosquito-borne illnesses as the recovery drags on. 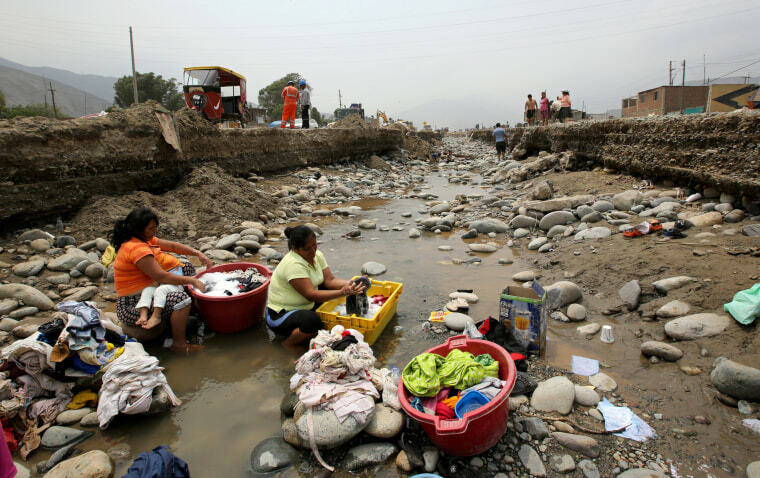 Residents do laundry in the flooded Ramiro Priale highway in Huachipa on March 20. 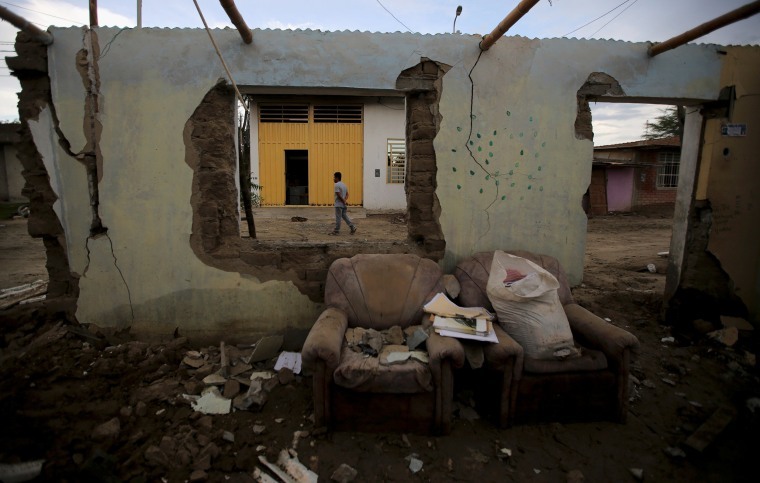 Residents clean their destroyed home in Huachipa on March 18. 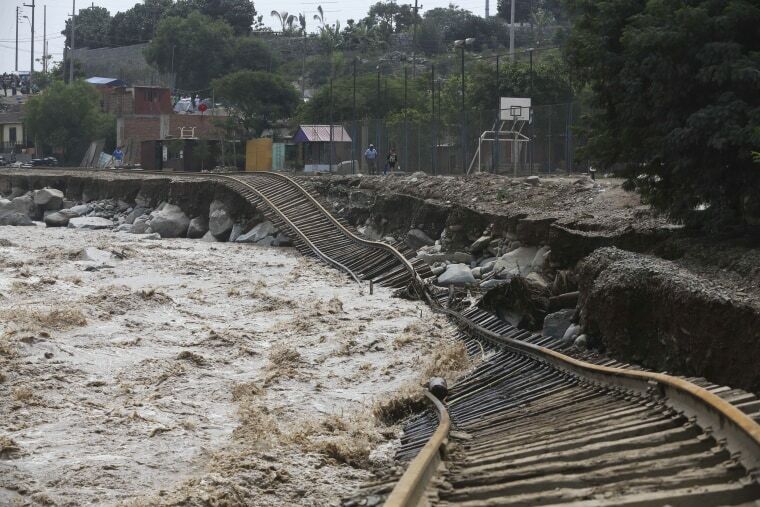 Train tracks lay destroyed in a flooded river in the Chosica district of Lima on March 19. A man recovers some belongings in Huarmay, a coastal region of Ancash on 22 March. 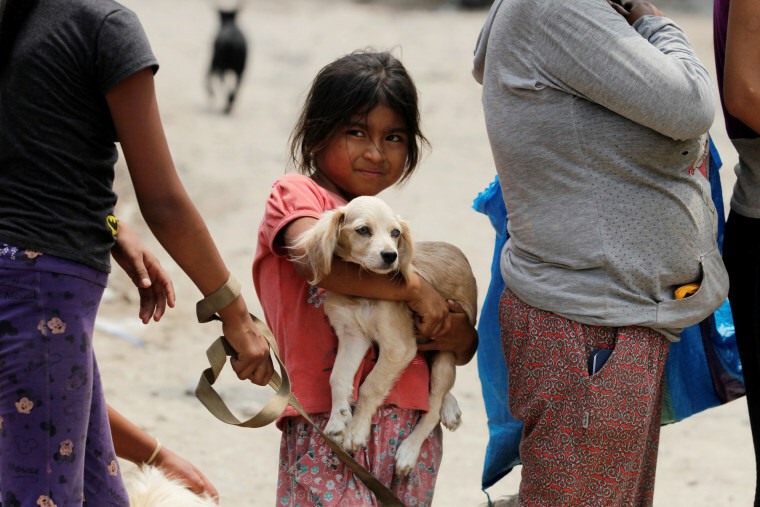 Pet owners stand in line for donated pet food in Huachipa on March 18. 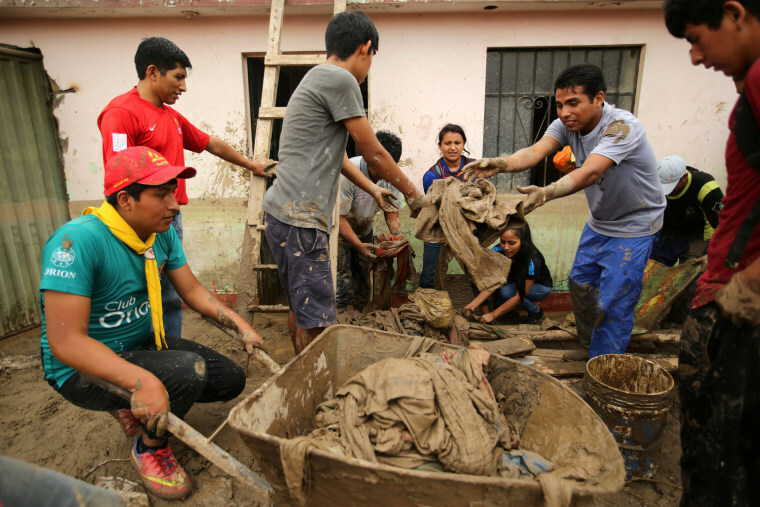 Volunteers clean a flooded home in Cajamarquilla, Lima on March 19. 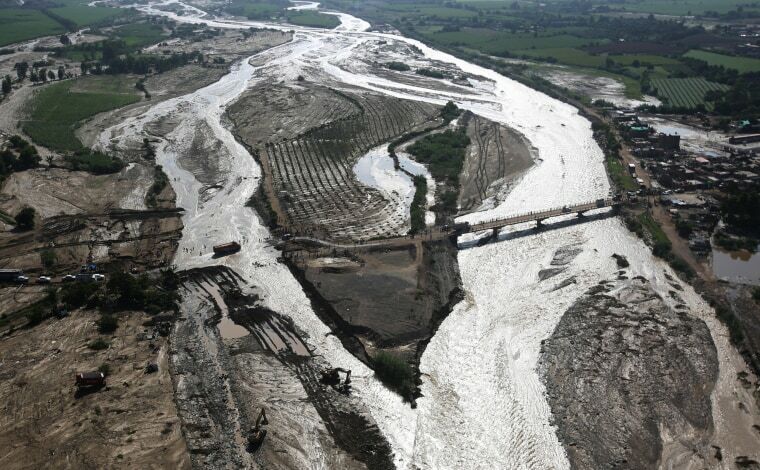 The Viru Bridge which carries the Panamerican Highway between northern Peru and Lima is seen collapsed in the Viru River on March 19. 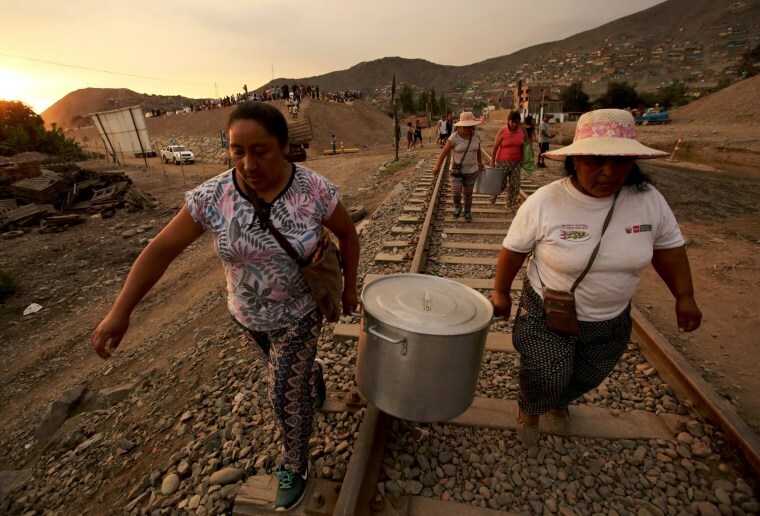 Residents carry donated food in Huachipa on March 18. 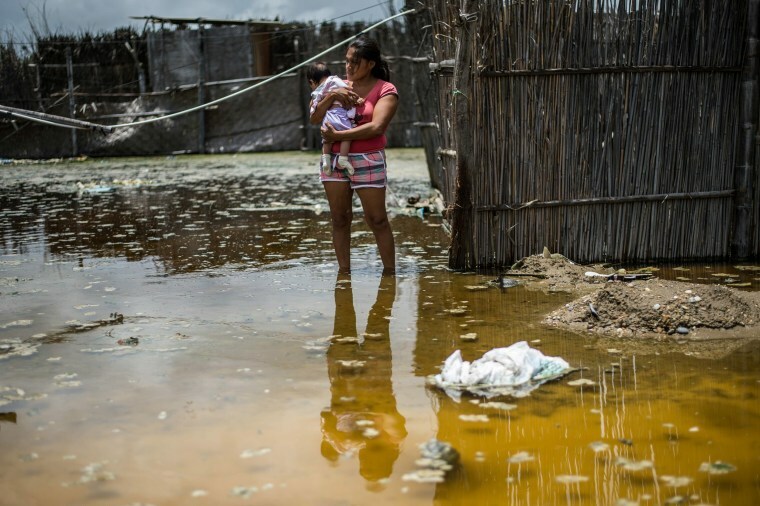 Residents stand outside flooded homes in the province of La Union in Piura on March 25.